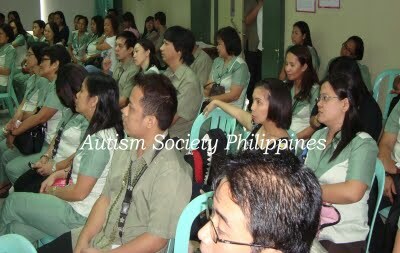 Autism Society Philippines (ASP) sponsored its screening. 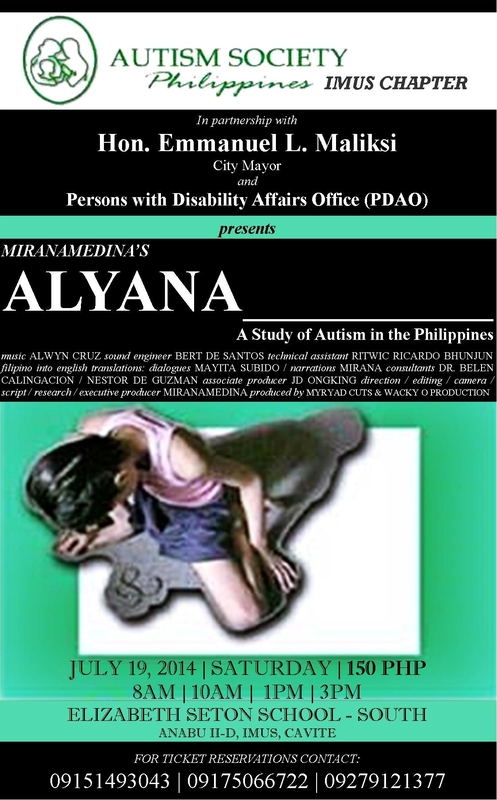 Alyana was premiered on July 20, 2006 at the UP Film Center in Diliman, Quezon City. 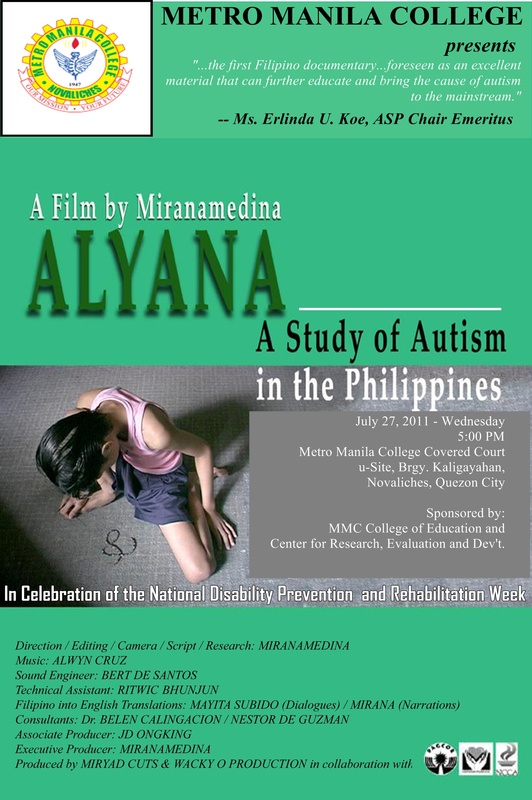 The first school to request for the showing of Alyana was Miriam College’s Psychology Department. 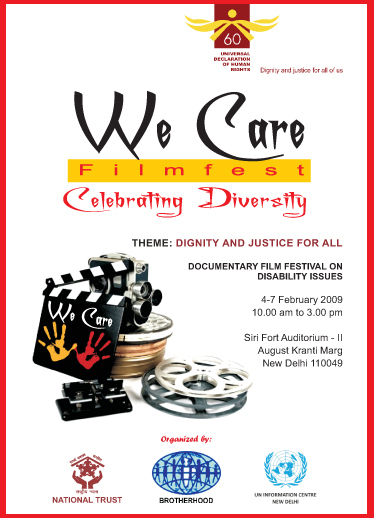 Venue: mini-auditorium. At that time, they were planning or have just started with their undergraduate course in Special Education. 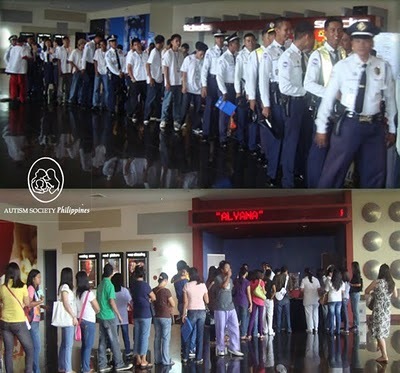 ASP Metro-South headed by Elvert Malapad initiated the screening of Alyana in Parañaque City. Then new chapter ASP Bacoor headed by Jan Peña took the initiative to show Alyana. The showing was quite successful. It was a running joke at the CineManila Secretariat that Alyana was the box-office hit at SM Cinema against all other CineManila entries. 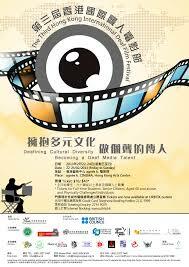 Alyana had a special screening in the above festival. My classmate and best friend at the Film and Television Institute of India, DiptiBhalla and KunalVerma, her hubby went to attend the film showing in my behalf. Second time that the long version of Alyana was shown to the public. They requested for it since the audience were mostly special education students. It was the celebration of UP Sped Week and the Alyana showing was one of their main events. It was my first time to meet then Prof. now Dr. Marie Therese Bustos who was so thankful re the fact that I managed to gather almost all the important personalities in autism education. 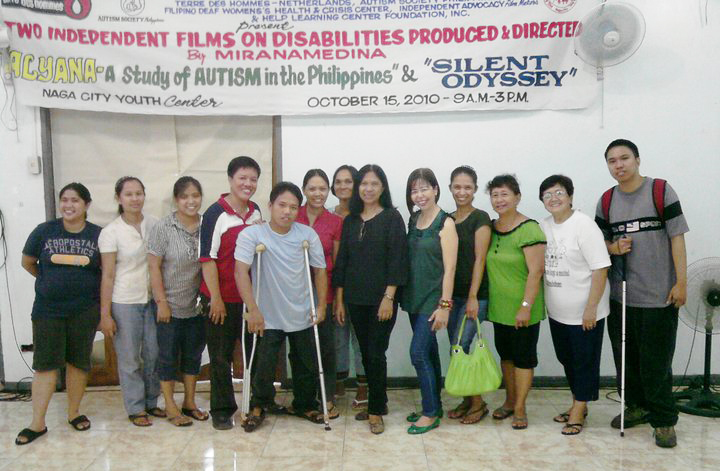 She said that Alyana is the most comprehensive film on autism in the Philippines. My first time to be in Cagayan de Oro City. I was brought straight to SM which is located near the airport where it was shown. Cynthia Bella was the ASP President at the time. 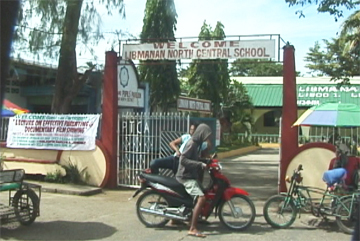 The screening of Alyana was organized by Busilak ng Pangarap Sped Center led by Teacher Salvacion Calabucal, one of featured interviewee in the film. 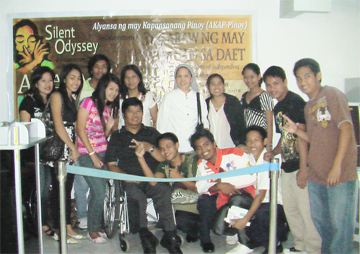 Innerwheel of Makati supported the screening. 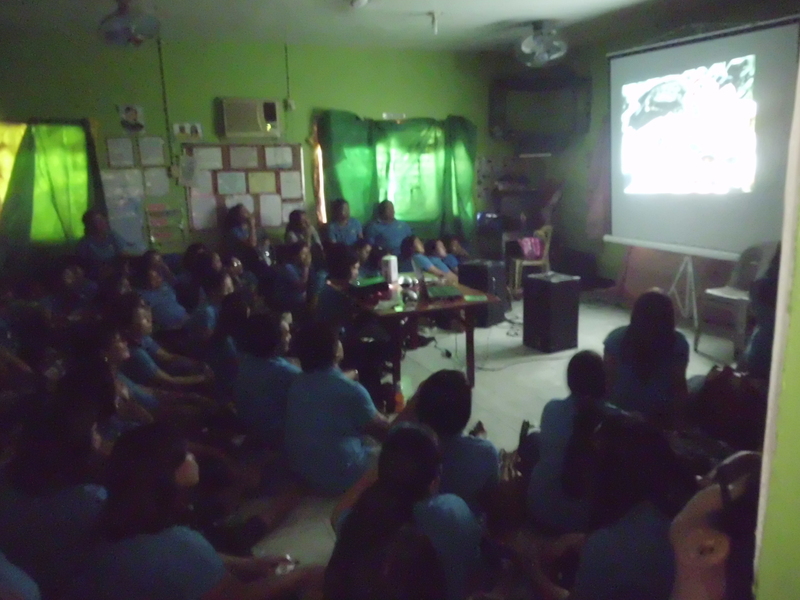 The screening at UP Los Baños was organized by ASP-Laguna Chapter headed by Riza Cansanay, Chapter President. 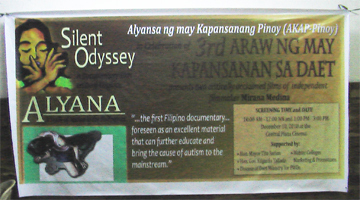 Sponsored by Rainbow Intervention Center for Autism Foundation, Inc.
Alyana was shown three times in Silliman University. 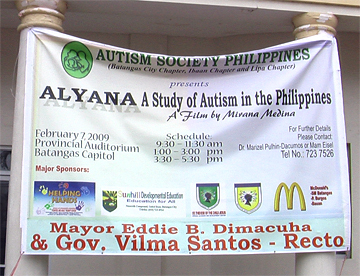 Twice when I first went there in December ’07, the third time when I was asked to return for a repeat show in February ’08 when the First Autism Forum in Dumaguetewas held. 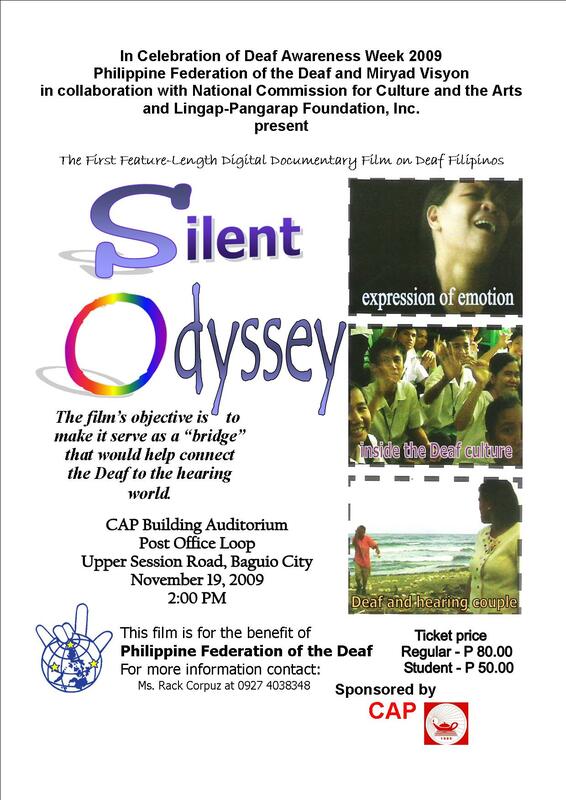 Sponsored by Autism Society – Iligan City Chapter, Societas Fidei and Kiwanis International. the NATIONAL TRUST and BROTHERHOOD in collaboration with the United Nations Information Centre for India (UNIC), New Delhi, Oxfam India and Asian Academy of Film and Television (AAFT). 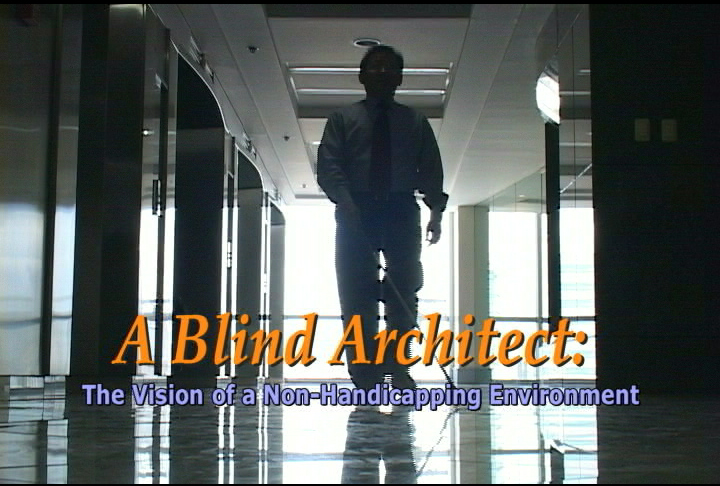 Starting this July and in all my showings thereon, if there is any, my short docu produced by APCD Foundation and JICA, entitled A BLIND ARCHITECT [14 min] which focuses on Non-Handicapping Environment for a Barrier-Free environment will be shown with SO and ALYANA. Excerpts from Alyana was also projected in the afternoon. 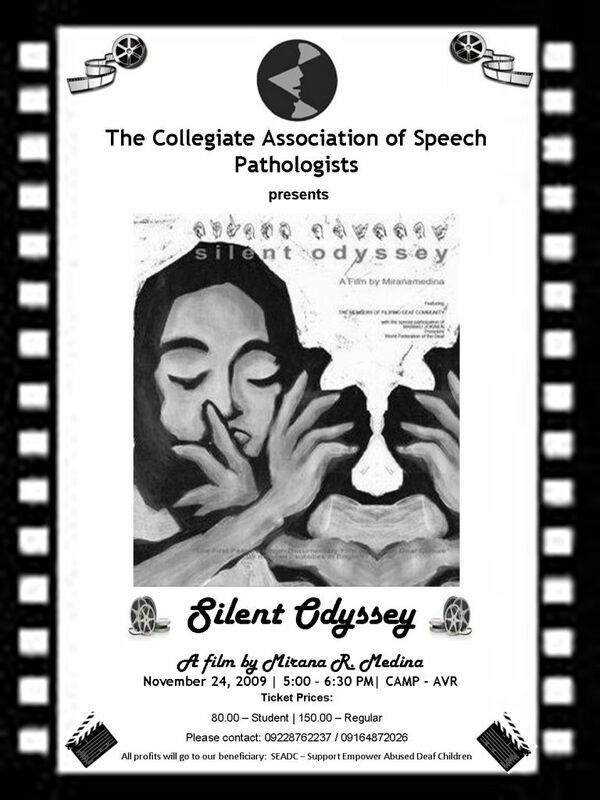 SILENT ODYSSEY in “Picture This Festival” , Canada’s First International Disability Film Festival, February 2010. 1008 – 14th Street S.E. Venue: Urdaneta Mansions, EDSA corner Ayala Ave.
in line with the 2010 National Disability Prevention and Rehabilitation Week Theme entitled “SA ISTRUKTURANG ACCESSIBLE, LAHAT AY ABLE” and as part of the Disability Week Culminating Night. The coverage of PWD Indignation Rally held last July 19 was also shown for the first time. 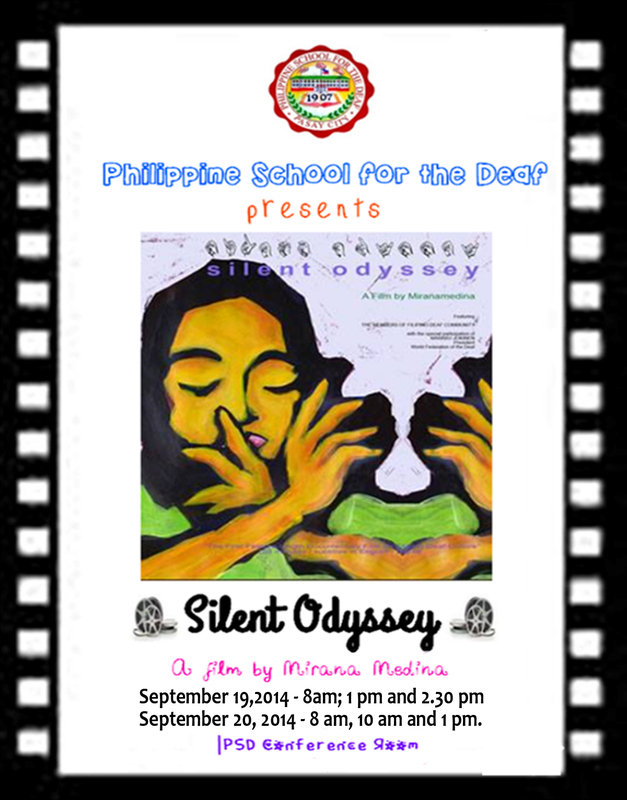 sponsored by Libmanan-KALINGA SPED and Rehabilitation Center in cooperation with HELP Learning Center Foundation, Inc.
sponsored by The Naga City Council for the Welfare and Protection of Children, Terre des Hommes-Netherlands, Autism Society of the Philippines, Inc. and HELP Learning Center Foundation, Inc. 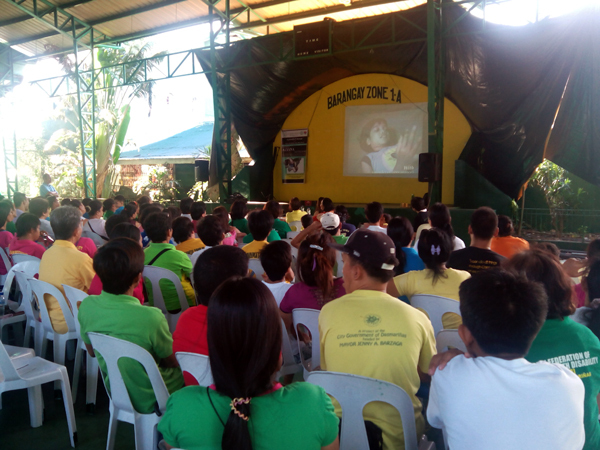 The screenings in Camarines Norte were facilitated by Mr. Rex Bernardo, Director for Research and Promotions, Mabini Colleges in collaboration with the LGU of Daet. 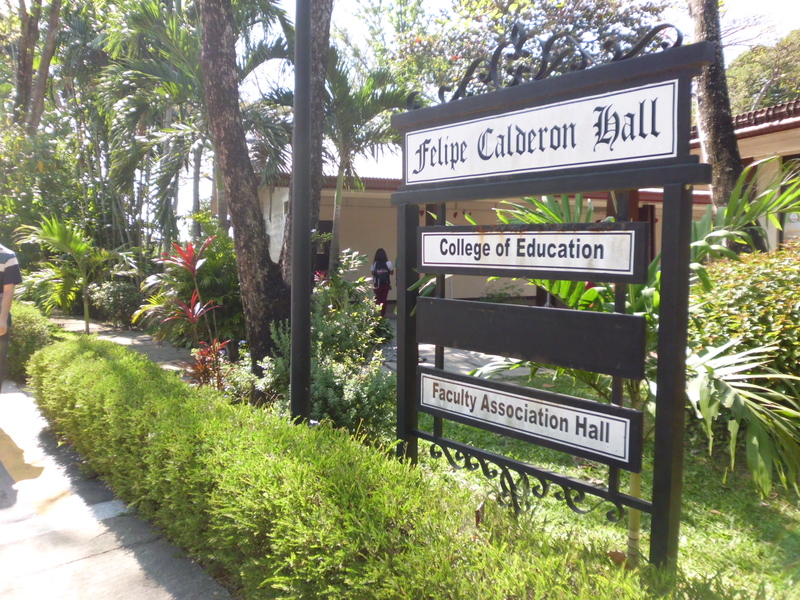 Venue – DL Umali Hall, UP Los Banos, Laguna. 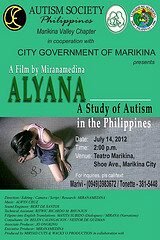 July 14, 2012 – ALYANA, 2 p.m.
31st cor 51st Street, Pamayanang Diego Silang, Ususan, Taguig City. Time: 9:30 – 11.30 a.m.
Time: 1.00 – 3.00 p.m.
Time: 9:30 – 11.30 a.m.; 2:30 – 4:30 p.m.
Time: 9:45 – 11.45 a.m.
Time: 12:30 – 2.30 p.m.
hi Mirana! I’m glad that Alyana still rocks! If there is a scheduled screening somewhere in Manila, please let me know… It’s nice to watch it again, and bring some friends over… thanks! keep me posted! Dale’s really proving to be a super kid! I am very happy for him and for you too! Yes! I’ll surely let you know if and when Alyana gets to be scheduled again in Manila… will keep in touch! The most difficult thing is to find a blog with unique and fresh content but i think you offer something different. Bravo. Hi Ms. Mirana! I am a special education teacher from a public school in Bulacan. 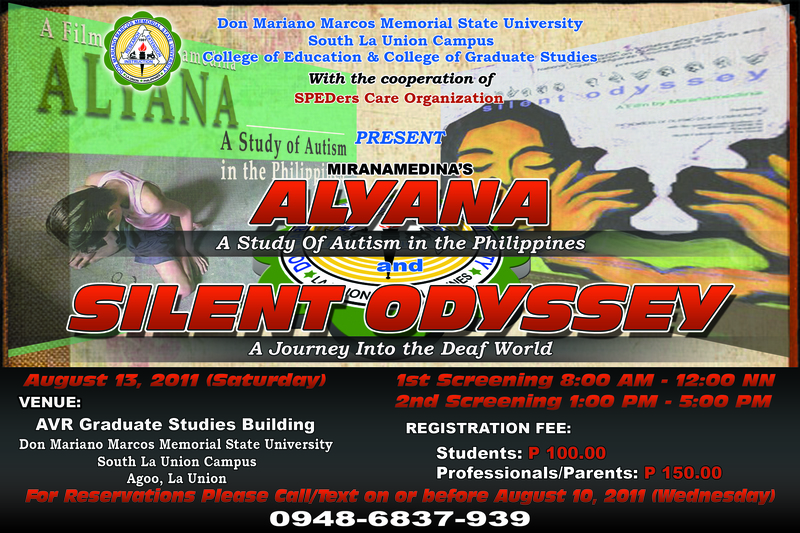 As part of the National Autism Week, we would like to show “Alyanna” to our parents in our institution. We are not yet a registered school in our ASP chapter that is why we are reaching directly to you. 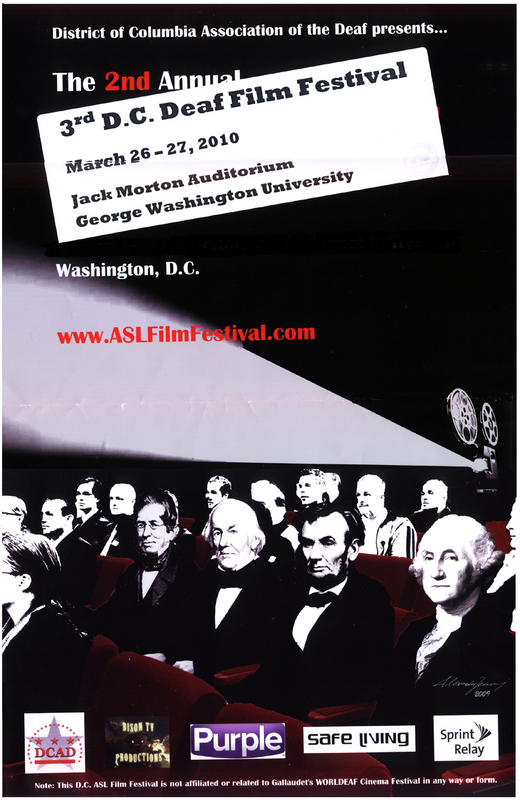 We are really hoping that you can find time talking to us regarding the procedures and guidelines in showing your film. Hoping for your kind response. Thank you very much! God bless. Let’s meet and talk about it this Sunday January 25 at SM Arena in MOA…We are celebrating Autism Consciousness Week. Just look for me. Ask the volunteer-photographers and videographers [in black t-shirts] for my whereabouts.